Miami does not really need an introduction. It is well known across the globe for its glitz and glamor and its beaches and sunny weather. Miami is a city that will capture you with its dazzling glamor and hold you in its spell. The beauty of the city’s nature will also steal your heart from Biscayne Bay and the clear blue South Florida skies. Miami is glamor first and foremost but spend a little time here and dig a little deeper to see what is under the surface. Or simply go with the flow and indulge in the glamor in true Miami style. Hosting over 150 specialty and tourist shops, cafes and restaurants, Bayside Market place has it all. As well as well known chain stores visitors will find an array of charming boutiques in this outdoor style mall. Located along Miami’s waterfront, as the name suggests, many locals come here to soak up the lively atmosphere and admire the bay, with its daily live music and fun vibe the Bayside Market does not fail to entertain. Recognized as one of Miami’s greatest treasures, The Vizcaya Museum and Gardens with its stunning architecture, grounds and artwork are certainly worth a visit. Featuring 34 rooms arranged around a breath taking courtyard, the Renaissance-style villa is filled with the most exquisite European furniture and arts reaching from the 15th to the 19th century. Over 1,100 craftsmen were bought over from Europe for true authenticity in design, to complete this 28-acre estate. Providing animals with habitats close to their natural setting, Zoo Miami visitors get the sensation of exploring a real safari. With open-air exhibits and a cage free environment, zoo visitors have a chance to enjoy endangered wildlife up close. With lots of interaction with the animals, Zoo Miami while not the biggest is fantastic for families especially for the younger ones with a children’s zoo featuring a range of different attractions including camel rides! While Calle Ocho is know as the heart of little Havana and setting for most of the activity , the district has slowly spread into the surrounding streets and avenues. Encompassing mangrove forests, salt marshes, a coastal dune island, coastal tropical hardwood rockland hammocks and endangered pine habitats, this 440 acre Deering Estate at Cutler property has it all. Also home to the Richard cottages c1900 which served as a hotel, the Deering Estate hosts other historical buildings of importance dating from 1896 to 1922 and an Indian burial ground circa 1500. Visitors are welcome to stroll through the stunning grounds, explore the houses or simply relax and soak up the surroundings. With its many interactive exhibits and a large number of hands-on displays the Miami Science museum offers a truly immersive experience encompassing a wide range of scientific fields including physics, biology and chemistry. Established in 1950, the museum has grown significantly and has expanded its space considerably throughout the years. The Museum exhibits regularly change offering fresh themes and displays to a 2nd 3rd or 4th visit is never too much. Built in 1925 with a the important role of an immigration-processing center for the many hundreds of thousands of Cuban refugees that were arriving, today freedom tower stands as a tribute to Cuban immigration and proudly stands out as one of the most striking and oldest skyscrapers in southern eastern United states. Freedom Tower also served as the head office of the Miami Daily New for many years. Actively rehabilitating and rescuing Florida’s endangered manatees, the Miami Sea Aquarium has forever been a firm family favorite attracting visitors from far and wide. With daily shows displaying dolphins, killer whales and other ocean mammals, the aquarium will delight any visitor. If that’s not enough, check out the large observation tanks containing a wide range of tropical fish, sharks and even alligators. Still not satisfied? Why not get involved in the “swim with dolphins” program that educates about the behavior and natural history of dolphins. Standing out prominently on the waterfront in a fresh and developing area of town, The American Airlines Arena is the main venue for large concerts and many other events including top name singers and of course the home of NBA’s Miami Heat. With a Capacity of 19,000 people, the building opened in 1999 and had proudly been awarded the Leed Green Building Certification for being a super energy efficient building. Located on the east side of Biscayne Boulevard, Bayfront park was refurbished and given a fresh new look in the 1980s. Highlights include an electronically controlled Pepper Fountain, a huge amphitheater used for a range of musical events and performances, a tower for laser illuminations and features three very important monuments; the challenger memorial commemoration to the crew of the challenger aircraft that exploded in 1986, the touch of friendship; a symbol of Miami’s relationship with central and south America and the World War II Memorial. Running along the Oceanfront of Miami Beach and passing by the iconic sands of south beach, Ocean Drive is a popular tourist destination night and day and offers a great opportunity for those with a special interest in the unique skyline and scenes Miami has to offer. The Beacon being some of the most exciting and notable structures in the area but also don’t forget to look out for those beautiful pastel colored art deco buildings. Renowned for being the most popular section of Miami beach, in the summer the beach is packed with locals and visitors from around the world but in the winter months the area becomes more of a chilled out area and is a great place to take a stroll whilst admiring the art deco buildings that provide a backdrop for the beach. Founded back in 1983 but only moving to its current site as recently as 2003, the Miami Children’s Museum is a great place for children to be educated and entertained at the same time. Appealing to the imaginations and curiosity of youngsters the exhibits are interactive and revolve around themes such as cultures around the world and art. The museum is set in a unique looking 56,000 square foot building. 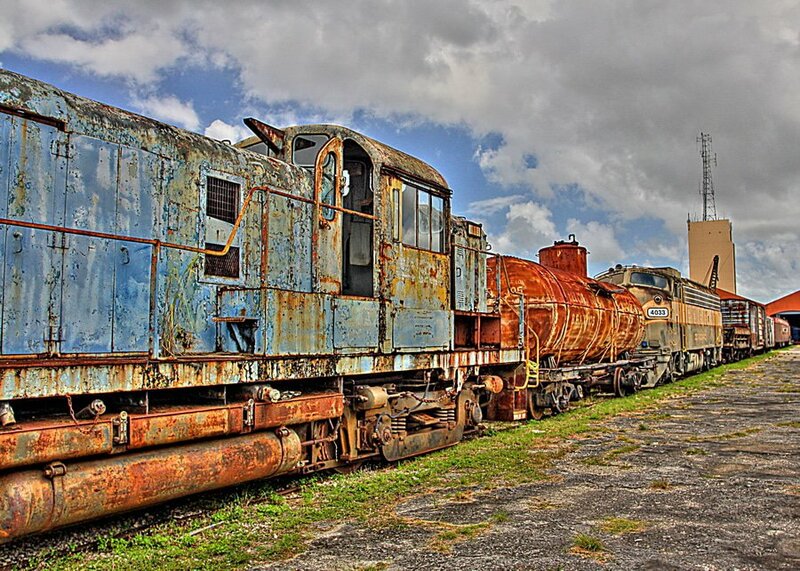 The Gold Coast Railroad Museum was created in the 1950’s by the Miami Railroad Historical Society and houses 30 historic locomotives in pristine condition. Famous carriages include the one that once carried Roosevelt, Truman and Reagan. Also at the museum is an impressive and detailed model railway that is worth admiring. There are also some wooden toy train sets for children who will inevitably be inspired to play with trains after looking around the museum. South of Miami Beach and across the Rickenbacker Causeway you will find Key Biscayne, a beautiful but small area with stunning beaches and fantastic park areas. 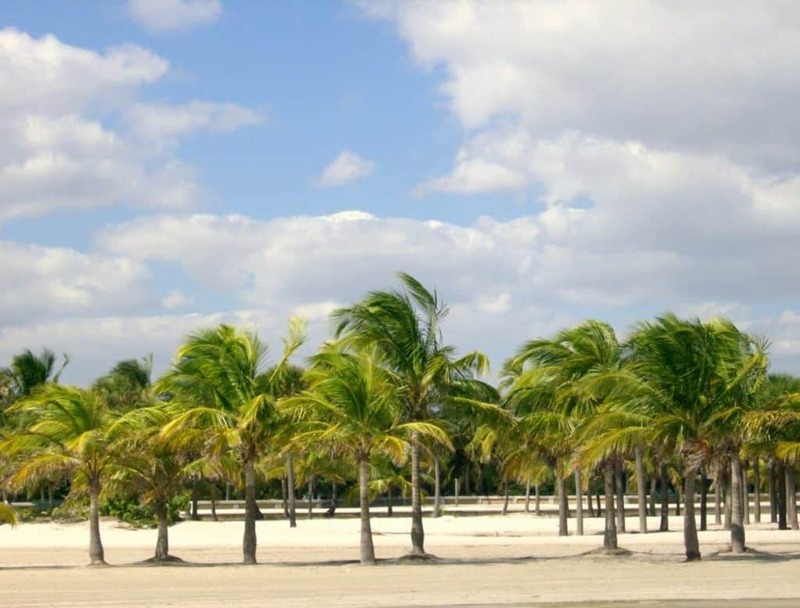 Crandon Park is probably the most visited park in the area and for good reason. The reef here means that the swimming conditions are ideal. Also in the park, you will find an Amusement Center and Nature Center adding even more to the family appeal of Crandon Park. Facilities in the park are good with plenty of parking and lifeguards keeping lookout year round. Fairchild Tropical Botanic Garden has a vast collection of rare tropical plants including vines, flowering trees and cycads. The gardens are open year round except for Christmas day. Exhibits of note include the Richard H Simons Rainforest which was built thanks to a generous grant and showcases the habitat of tropical and often endangered rainforests around the world. Coral Castle is the work of eccentric Latvian American artist Edward Leedskalninand is made from 1100 tons of coral rock. The building was built by Edward alone and is both an impressive feat and a stunning work of art. It is not actually known how Edward achieved this massive feat and this is partly the reason why so many visitors to the castle are left fascinated by their trip. The Venetian Pool in Coral Gables just outside of Miami is a little taste of Venice. It is a historic aquatic facility and attracts hundreds of thousands of visitors each year. It was built in 1923 out of a coral rock quarry. The pool holds 820,000 gallons fed from underground spring water and in the busy spring and summer months in emptied and refilled daily. The pool gets very busy in peak season and the attraction stops selling tickets once its capacity is reached. Situated on Miami Beach, the Holocaust Memorial of the Greater Miami Jewish Federation is a good place to take time out and pay respects to the victims of the holocaust. The memorial itself was designed by Kenneth Treister and commissioned by a small group of holocaust survivors. During its planning period, many people objected to the memorial being built saying it would ruin the fun and sun party atmosphere of Miami Beach. The Wolfsonian FIU is a museum, library and center for research located in the Art Deco district of Miami Beach. The museum is what will interest you. It houses a range of exhibitions that explore design at its most intelligent and most beautiful. The museum is affiliated with the Smithsonian and explores everything from book covers to propaganda pieces. There are plenty of theaters in Miami but none are as iconic as the Olympia Theater. Located on Flagler Street, the theater has a range of performances and events throughout the year ranging from concerts to comedy but what will really stick in your memory is the interior decor. The theater is styled in Moorish fashion with splendid balconies and columns that would not look out of place in North Africa.